A couple of weeks ago while I was posting my ‘On this Day’ post to my Facebook page I noticed that for that particular date there were two different soup posts to choose from. A few days later, I ran into another soup post… And then a few days after that, yet another. I decided to check, and it appears that in every January since I began writing For Love of the Table, I have shared at least one soup recipe. It seems that January is soup month….at least as far as For Love of the Table is concerned. And of course it makes sense to be hungry for soup in January. Soup is warming and filling—just what you need during cold…and sometimes damp…weather. It is also nourishing…. Whether or not it plays a role in curing a cold or the flu, sitting down to a bowl of steaming soup will almost always make you feel better. Furthermore, soups are typically fairly lean when it comes to calories and will fit nicely into most reasonable diet plans (should that be part of your January regimen). So to keep up the streak, I thought I would share the delicious soup that I made over the weekend: Black bean with Butternut squash and Spanish Chorizo. It was just the thing to have on hand during our recent spate of bone-chilling temperatures. When you make your soup, I recommend cooking your beans from dried. You can of course use canned black beans. There are several good brands that are widely available…and they are truly convenient. But if you have the time, I think the dried really are better. 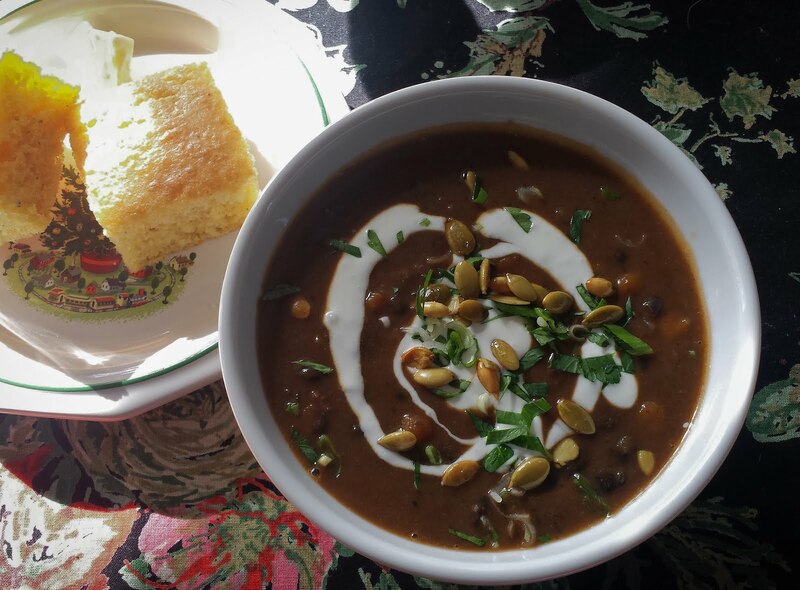 When made with dried beans the final flavor seems richer (no surprise since you have the delicious bean cooking liquid to add to the soup)…and the texture more velvety. It was in fact the presence in my pantry of a couple of pounds of very nice dried black beans from a local grower that put me in mind of a black bean soup. I wanted to use some of those beans in a place where they would truly shine. You may cook the beans using whatever method you prefer—in a pot on the stove, in a wide pan in the oven, or a pressure cooker or Instant pot. I think the beans cook more evenly if they are given an overnight or a quick soak, but you can cook them straight from dried too—just add an hour or so to the cooking time. But this soup isn’t just about the beans. It’s also about the sweet winter squash (excellent with black beans)…and the subtle smoky flavors of the Spanish chorizo and paprika. 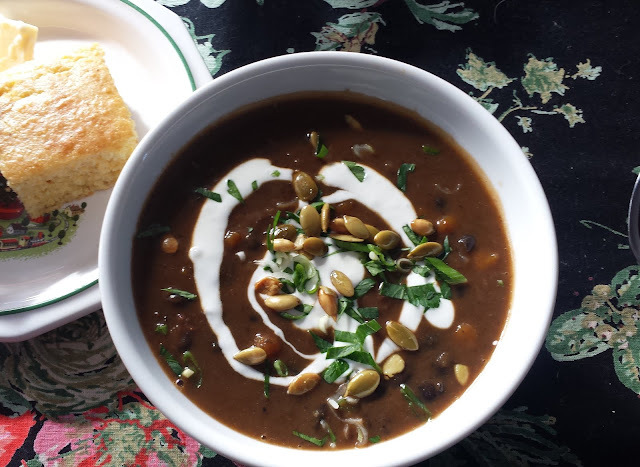 This isn’t just an ordinary black bean soup….and we loved it. It made a terrific dinner (with a big piece of warm cornbread). But I think I liked it even better during the next few days for lunch. After a day or two the texture is even creamier…and the flavors more developed and nuanced. Although, I have to admit that my feelings about this may have something to do with the fact that sitting down to a delicious bowl of hot homemade soup in the middle of a freezing cold January day is the very embodiment of Comfort Food. Warm the olive oil in a medium sized soup pot or Dutch oven set over moderate heat. Add the onions and sweat without color until very soft—15 to 20 minutes or so. Add the garlic, chorizo, and spices and cook briefly to infuse the flavors into the fat and onions—about 5 minutes. Add the squash and stir to coat with the onions, chorizo and spices. Season with salt and continue to cook for another five minutes. Add the stock/water, adding enough so that the squash moves freely in the liquid and is completely submerged…but not “swimming” in the liquid. Bring to a simmer and cook (adjusting the heat to maintain a gentle simmer) until the squash is tender—about 20 minutes. Add the beans, along with enough bean cooking liquid or water so that everything is submerged, moving freely, but not swimming. Return to a simmer and cook for another 15 minutes (at a low simmer) to allow the flavors to blend. Taste and season as necessary with salt and pepper. If you like, add the Sherry. If the consistency of the soup pleases you, the soup is ready to serve. If you would like a creamier soup, remove a cup or two of the soup and purée until very smooth using a traditional or an immersion blender. Return the puréed soup to the pot and heat through. Serve topped with a generous drizzle of thinned sour cream and a scattering of parsley, green onion and pepitas. Makes a generous 2 quarts of soup. You may cook your beans from dry or use canned. If you use canned, you will need 3 15 oz. cans. Drain and rinse the beans before using. Add fresh water to the soup when adding the beans. If using dried beans, you will need 12 oz. (1 3/4 cups) of black beans. Cook them according to your preferred method—on the stove top, in the oven, or using a pressure cooker or an Instant Pot. I don’t own either of the latter two. My preferred method is to soak overnight (or use a modified quick soak) and then bake them in the oven. Black beans take about 2 hours. Add 2 or 3 T. of olive oil, a cinnamon stick, a couple of well-branched sprigs of thyme and 3 or 4 peeled and lightly crushed cloves of garlic before adding the water. Salt half to three quarters of the way through the cooking process. If you prefer, you may replace the cured Spanish chorizo with 4 oz. of fresh Mexican chorizo. If using Mexican chorizo, consider finishing with a squeeze of lime juice instead of Sherry and roughly chopped cilantro instead of parsley. If you like to add something acidic, you can add a 14 oz. can of diced tomatoes. Add it after adding and cooking the chorizo and spices, cooking until the tomatoes are slightly thickened. Add the squash and continue as directed in the recipe. If you would like some spicy heat, add 1/8 to 1/4 t. of cayenne or 1 t. of chipotle chili powder with the spices and chorizo. Toast pepitas (pumpkin seeds) in a 350° oven until they are light golden and beginning to puff and pop…about 5 minutes. Drizzle with a small amount of olive oil and season with salt. I'm so glad you liked it!! Thanks for letting me know!